View More In Punches - Page 5. This pliers can only be used for ribbons and some thin fabrics. It cannot be used for hard objects such as iron. For the first time, there will be a black oil above the hole needle. First, play a few more on the unused fabric and clean the black oil. Do not let children come into contact. ❤ Specialty designed hole-punch pliers are perfect for adding a clean hole without rough edges. ❤ The punch pliers have spring-action jaws reduce effort and allow faster work. 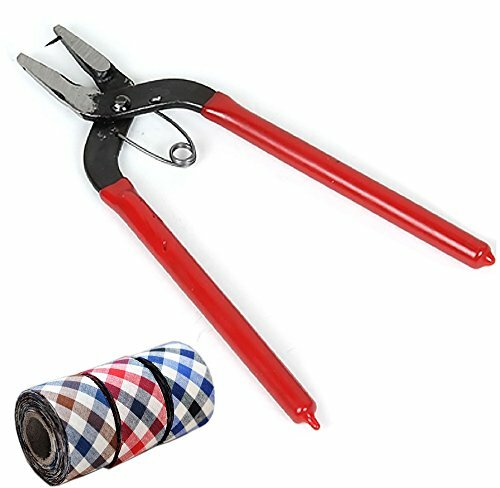 ❤ Suitable for handed punching a hole on Belt, Leather or watch Band, Superior Quality for the action that stand alone at the top in the industry of craft, hobby and DIY project tools. ❤ The punch pliers made of double-dipped PVC handle is comfortable in hand with non-slip hold even with wet hands. ❤ 100% Guarantee - For such high-quality products,7TECH promises for 100% satisfaction to our every customer and hassle-free money back for non-artificial damage.